Over the last seven days, we've seen Taylor Swift make Apple tremble. We've seen Amazon announce idiocy. We've seen Office appear on Android. And we've seen sci-fi speeders swoop from the silver screen and into the real world, where there's a very good chance they'll twang their riders into the nearest tree. 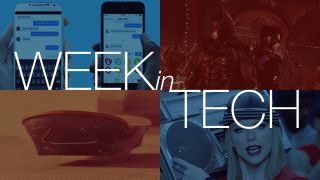 It's a potentially painful Week in Tech! The world's nicest superstar, Taylor Swift, has persuaded Apple to dump its plans to offer three-month free trials of Apple Music without paying artists – or if we're being pedantic, without paying artists' record labels. The U-turn happened on Sunday when Taylor Swift told her millions of followers that Apple was doing a bad thing, and since Apple changed its mind it's suddenly found record labels and artists' representatives much more receptive to its overtures. Apple Music is due to launch next month, and Google is ready for battle: it's launched a free, ad-funded radio service in the US, although there's no launch date for other countries just yet. Good news for fans of quantity over quality: from July, Amazon will be paying ebook authors according to how many pages book borrowers read, rather than the pay-per-borrow system it currently operates. As Hugh Langley says, "Amazon's proposition could affect the way books are written, encouraging cliffhangers and a more engrossing writing style. Those might sound like positives, but the reality is Amazon nudging authors to be more formulaic and we, the readers, will pay for it." Expect to see short stories stretched to silly lengths and books made of clickbait. Microsoft's transformation from a Windows company to an apps-on-anything company continued this week with the launch of Office, for free, on Android. The apps are direct rivals to Google's own online apps, and the only requirement is a (free) Microsoft Account – although if you want to unlock advanced features for power users you'll need an Office 365 subscription. Windows is still important, of course, and Windows 10 is the most important Windows yet. The launch is just a month away, and Microsoft is starting to nail down specifics such as European pricing. If you aren't eligible for the free Windows 10 upgrade, which will be available until next summer, you'll pay £99.99 (€129) for Windows 10 Home. Prices for the Pro version haven't been announced yet. If you want to use Facebook Messenger but don't want to cuddle in the loving embrace of Facebook proper, we've good news: you can use the Messenger app with nothing more than a phone number. There's a catch, however: you need to be in Canada, the US, Peru or Venezuela until the new feature is rolled out worldwide. Like Microsoft, Facebook is embracing mobile in all its forms – so if it can't persuade you to use its main app, it'll create spin-off apps such as Messenger too. Samsung has been rightly pilloried for some of its bloatware-happy ways, but even by its crapware standards we've reached a new low: it turns out that the firm has been disabling Windows Update on its laptops, preventing users from keeping their PCs secure and up-to-date. That's not why Samsung did it, of course – it looks like it's there to stop Windows downloading driver updates that might not work properly – but that's the end result. In other news from the world of stupid, it's been alleged that Google's Chrome browser has been listening to you without asking permission. Developers of the Chromium browser say that the listening feature, which is used by "OK Google," is automatically turned on by default and may be listening to your conversations. Google says that you shouldn't worry, and that it's not its fault anyway because big boys did it and ran away. In one of the most disastrous PC game launches of all time, the PC version of Batman: Arkham Knight has been pulled from sale on the grounds that it's completely hopeless. There's a low frame rate, missing visual effects, stuttering and other issues. At the time of writing there are 6,104 negative reviews on Steam. Rebelphoenix gives a flavour: "I can't defeat the intro boss," he writes. "His power of screen flickering is just too strong." Looks like the US military has been watching Star Wars movies again: it's developing real-world speeder bikes to whoosh past Ewoks. The hover bike is much cheaper and more flexible than a helicopter, and from what we've seen of the tech so far it also looks hilariously difficult to control – as does the Lexus hoverboard, which is straight out of Back to the Future. It's a maglev board with liquid nitrogen-cooled superconductors and a metal track to hover above, and the lack of any real riders in Lexus' promo videos suggests that it's going to be a lot harder to ride than Lexus would like us to believe.